Entire new cities are being built across Asia and Africa as emerging markets step onto the global stage and challenge our paradigms of how the world works. Over 40 countries are currently building hundreds of new cities — places with names like Cyberjaya, Naypyidaw, Nanhui, Gracefield Island, Dompak, and Tbilisi Sea New City — which are attempts at redefining what entire nations are and the role that they play in the global economy of the future. I will start this list with one of the most controversial new city building projects to break ground in recent years — or, as the case is, make ground. With $100 billion of funding behind it — roughly the total annual GDP of Morocco — Forest City is designed to be the Malaysia’s answer to Singapore. Built as a partnership between the Chinese developer Country Garden and Esplanade Danga, which is 99.9% owned by the Sultan of Johor, Forest City was designed to attract masses of Singaporean residents and Chinese real estate investors looking to offshore their assets. Forest City is nothing if not ambitious. It is idealized as a “city of the future” — an eco-city four times the size of Central Park in New York where the buildings will be covered in plants and there will be no cars. Accommodation is currently being built for 700,000 people, as residential high-rises, office towers, shopping malls, and hotels are rising up from land that was reclaimed from the sea. That’s right, Forest City is being built on four artificial islands which protrude from the tip of peninsular Malaysia and flank the northwestern corner of Singapore, which sits hardly two kilometers away. Due for completion in 2035, Forest City is envisioned to be a new economic engine that could compete with Singapore and create 220,000 jobs. However, this is an endeavor that has been much maligned in the international and regional media. Criticisms revolve around the contradiction of an “eco-city” that is built on 162 million cubic meters of shipped in sand that has severely disrupted the surrounding maritime environment, to it being a political firing rod between the governments of Malaysia and Singapore, to a simple analysis of economic fundamentals: as in, who is actually going to buy and live in all of these new homes? There are also some other elements of the project that come off as a little obtuse. Such as the fact that if 700,000 people really were to be packed into Forest City’s 14 square kilometers it would make it the most densely populated place on the planet, as Kobie pointed out in her story for Wired. China’s state-level new areas are pretty much guaranteed to succeed. That’s what recent history tells us, anyway. The state-level designation means that a new development area has the full support of Beijing — meaning billions of dollars of investment and the political power to move companies and institutions in — by guile and fiat. Pudong (Shanghai), Binhai (Tianjin), Liangjiang (Chongqing), Nanshan (Guangzhou), and Tianfu (Chengdu) are all state-level new areas and, not coincidentally, are some of the biggest economic engines that China has today. So when a new state-level new area is announced it not only garners a massive amount of attention but a massive amount of investors who are gung-ho to get in early and have few qualms about throwing down large sums of money. This is especially true when the new state-level new area is located near a city like Beijing and is touted as being a core part of a major massive development initiative to link multiple big cities together into a mega-region of unheard of proportions called Jing-Jin-Ji. Xiong’an is the newest State-level new area in China, and early reports began positing that it could become “China’s third economic engine.” Created from scratch last April, the new development zone which sits 100 kilometers from Beijing sparked such a flurry of economic activity that investors proverbially broke the place. Regulators had to step in and temporarily pull the plug on local property sales as the prices spiked from $1,450 to $2,500 per square meter in a matter of days and a quarter of the 20 top stocks on the Shanghai exchange had to suspend trading for two days after eclipsing their daily limits. Initially, Xiong’an is expected to cover an expanse of 100 square kilometers and then incrementally grow to become a 2,000 square kilometer colossus — which is significantly larger than Greater London. Nor is Xiong’an envisioned as a “bedroom community” commuter suburb. Instead, it will be an entirely new city. At an equivalent distance from Beijing as the city of Tianjin, daily commutes are not practical, even with high-speed rail. The project has more in common with “new capitals”, cities purpose-built by edict around the world such as Canberra in Australia, Brasilia in Brazil, and Putrajaya in Malaysia. However, the Xiong’an strategy takes this idea and turns it inside-out: the new city’s purpose is to be everything that Beijing doesn’t want to be, and allow Beijing to strengthen its core purpose of being the national administrative centre. Xiong’an is meant to become a new hub for China’s trademark economic “experimentation,” where more free-market policies and systems are tried out in an almost laboratory-like setting that can be easily controlled and adapted. The place is meant to become a hub for research, education, and high-tech R&D, and we can expect to see a large amount of such institutions — such as firms from the Zhongguancun tech zone and science and engineering units from established universities — being shipped in. Far out on the Eurasian steppes, one tick from the Eurasian Pole of Inaccessibility — the farthest point on earth from an ocean — is a bi-national development zone that is set to shake up how we view the economic potential of the inland realms of Eurasia. Straddling the border between China and Kazakhstan is a place called Khorgos. On the Chinese side there is the $3.25 billion new city of Horgos that is being built for 200,000 people and on the Kazakhstan side is the Khorgos East Gate special economic zone, which contains the 49% Chinese owned Khorgos Gateway dry port. Connecting the two sides is the International Center for Boundary Cooperation, which is a one of a kind bi-national duty free zone. While multifaceted urban development is booming on the Chinese side of this development area, the Kazakh side remains rather, let’s say, transport-oriented. At this point, it’s basically just a train station. But this is all set to change, and Nurkent is what’s intended to put the wheels of this transition in motion. Nurkent is a purpose-built new city that links together the various transportation and industrial projects of the Khorgos area. As of now, it is basically just a work camp of 1,200 people — the employees of the dry port and nearby customs offices and train station and their families — but it is set to grow into a full-fledged 100,000 person commercial and cultural center by 2035. This is an endeavor that is coming straight down from Kazakh President Nursultan Nazarbayev himself, it is said, and it is a key part of his $9 billion Nurly Zhol initiative to diversify Kazakhstan’s economy via the transportation sector. 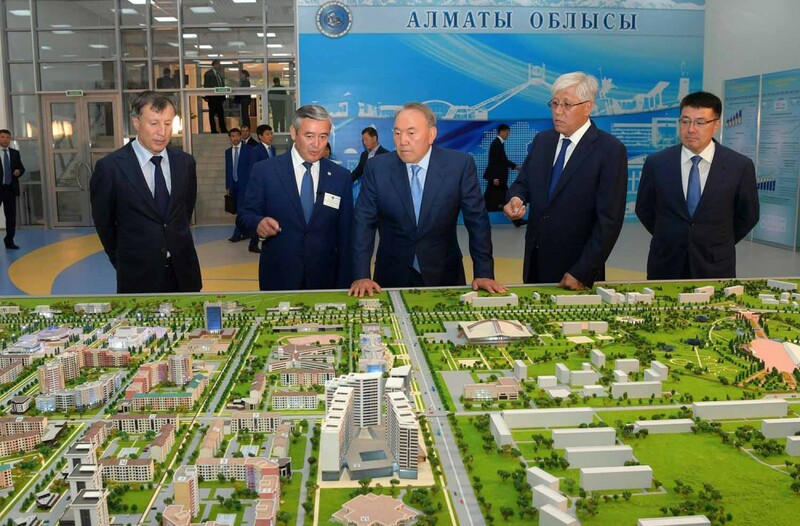 $34 million has already been allocated for the new city and, if what Nazarbeyev did with Astana is any indication, expect big changes to come to Nurkent in the near future. Another controversial China-backed, large-scale urban development project on reclaimed land, Colombo Port City is set to transform the coastline of Sri Lanka’s capital city. Sitting in the heart of the Indian Ocean near the busiest shipping lane in the world, right between East Asia, the Middle East, and Africa, it’s the location of Sri Lanka that’s of interest to China. With an array of new Chinese ports going up from Asia to Europe along the Maritime Silk Road — a.k.a. China’s lifeline to its energy suppliers in the Middle East — China was looking for a place to plant a new financial center right at the center of it all. So in 2014, the China Harbor Engineering Corporation, a Chinese state-owned enterprise, put up $1.4 billion to build a new financial district located immediate south of a Chinese-run container terminal in Colombo. To avoid having to occupy existing land, the plan was to reclaim land from the sea, essentially extending the natural coastline outwards for 269 hectares. When completed in 2041, Colombo Port City is expected to become a quasi extra-territorial zone that will have its own investment laws and special policies. Basically, it is meant to become a seaside caravanserai, a place where traders would meet from all over the world to do business. It is slated to have a Formula One racetrack, loads of luxury hotels, high-end shopping malls, office towers, and everything a financial district would need to compete with Singapore to the east and Dubai to the west. To put it mildly, India isn’t pleased about China moving into what has historically been their backyard, encircling the country with major investment and infrastructure projects in Pakistan, the Maldives, and Bangladesh, in addition to Sri Lanka. The thinking is that these commercial projects could one day have military or other strategic implications — an apprehension that wasn’t eased when Chinese Naval submarines equipped to carry torpedoes and missiles popped up in Colombo’s harbor on two occasions in 2014. I’m taking a flier on Oman here. Another country looking to diversify its economy away from resource dependency, Oman is making an all or nothing bet on its fledgling transportation and manufacturing sectors, which are firmly aligned with China’s Belt and Road initiative. Pragmatically called the Sino-Oman Industrial City, this is to be a $10.7 billion transit-oriented new urban development on the coast of the Arabian Sea, 550 kilometers south of Muscat. It is being built via a consortium of private Chinese companies called Oman Wanfang, who hail from Ningxia Hui Autonomous Region — which is largely populated by Chinese Muslims. These companies are supplying the cash, know-how, and the boots on the ground to transform an empty expanse of desert into the region’s next boomtown. The 11-square-kilometer development project, which is located within the Duqm Special Economic Zone, aims to transform an underutilized port into a “mega-venture” that will include an oil refiner, a methanol plant, a solar energy equipment manufacturing operation, a car factory, a building material distribution operation, along with homes for 25,000 people and the schools, medical facilities, office complexes, and entertainment centers they need to actually live there. While the Chinese firms investing in Dumq are private this doesn’t mean they don’t have the backing of Beijing. China’s National Development and Reform Commission has already declared the project a “Top Overseas Industrial Park.” The fact that nearly 80% of Oman’s crude oil exports go straight to China could have something to do with this. “Is this how you build new cities in America?” I remember a development consultant asking me in 2014 as we were driving through what was then the initial stages of the new city of Nanhui on the outskirts of Shanghai. In the USA we built our new cities back in the 19th and early 20th centuries — in the time of our economic boom period, when we were an emerging market, rising up, smashing paradigms, and challenging the old guard of the global economic order.